Tesco, Britains biggest super market has seen its profits crash by 23.5% to £1.39 billion for the 6 months to Sept 30th, surprising the markets and prompting many worried investors such as Warren Buffett to start existing their Tesco holdings (Buffet cut his holding near immediately by 1/5th) as clearly something is seriously going wrong at Tesco's resulting in competitors such as Sainsbury's winning market share away from Tesco, which illustrates that it's a lot quicker on the way down than it was on the way up! Whilst the mainstream press focused on the global impact on reasons for the profits crash such as that 70% drop in trading profits from eastern europe to £55m. However, eastern europe is just a mere drop in the Tesco ocean which still relies for the bulk of its profits from UK trading (£1.1bn) where the real reasons for the collapse could largely be due to an exodus of large spending customers as a consequence of a stream of promotions that customers are unable to capitalise upon due to poorly paid, trained and motivated store staff, which is especially true for the high spending customers where for instance on promotions such as spend £40 for a £5 off voucher on your next shop results in customers LESS likely to shop at Tesco stores in the future. The problem at the heart of Tesco promotions is that the offers are poorly advertised in the stores so customers only tend to find out about them AFTER they have completed their purchase at the checkout and thus large shop customers fail to capitalise on the offers as for instance a £200+ shop customer could be in receipt of just one £5 off voucher instead of five (£25) if at checkout they had split the shop up into five separate £40 purchases for 5X£5 vouchers, a huge difference which will tend to leave a bitter taste in the mouths of big spending customers as to why the checkout Tesco staff failed to suggest splitting the shop up, this is the real experience of shopping at Tesco store's such as their Abbeydale, Sheffield superstore. "That you are not being fair on the other waiting customer(s)." If customers are not being fair by splitting up £200+ shops then Tesco should not engage in promotions that their staff discourage customers from capitalising upon! The consequences of which is that Tesco would be far better off NOT engaging in such promotions because it will result in large spending customers being less likely to shop at Tesco stores again, as competitor supermarkets that may be 2 or 3 times distance don't carry the additional burden of having to go through the stressful process of trying to do the checkout persons job for them by being aware of all of the various promotions available, and what needs to be done to capitalise upon them such as splitting up shops, requesting dinnerware tokens whilst ignoring disparaging comments from the checkout staff. At the end of the day - Shopping at Tesco's is just not worth the bother! Off course customers in receipt of such bad service can take the time to write a letter of complaint and likely within a couple of months will be in receipt of a letter of apology with an accompanying £10 voucher (less than £20 potential saving that their shop originally carried). a. That promotions customers could benefit from are not being suggested to customers at checkouts, which has huge consequences for large shop customers, as much as a loss of £20 on their next shop on a £200 spend, or stickers they could have collected towards dinnerware. b. Even where customers are aware of such promotions before checking out, customers can be presented with staff who tend to go out of their way to make the customer uncomfortable in attempting capitalise on the promotion i.e. " 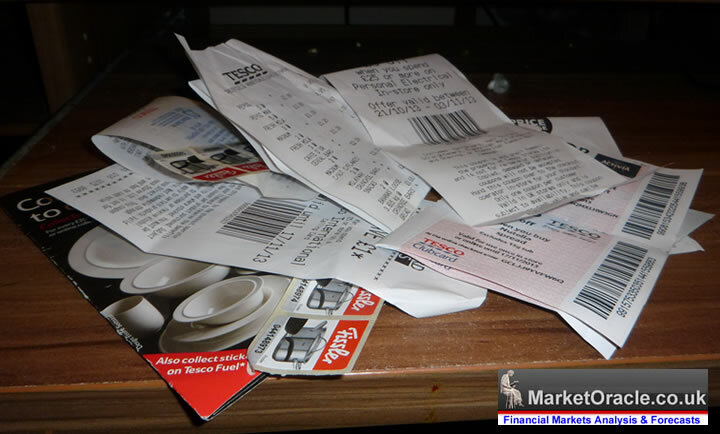 not being fair to other customers" when a customer attempts to break up a £200 shops into £40 checkouts. This is the real life experience of Tesco customers such as at their Abbeydale, Sheffield store. This explains why Tesco profits have crashed as their clearly is an exodus of large spending customers that looks set to accelerate over the busy Christmas period. The only way to fix a broken Tesco's is for Tesco to scrap any promotions that engage the store staff i.e. £5 off for £40 spend vouchers should be replaced with an automated 10% off your next shop promotion that are not reliant on the actions or inaction of store staff in the implementation of such promotions. Similarly stickers for dinnerware should be printed onto receipts so that it is not upto customers to remember to ask for them or rely on staff to suggest because in most cases staff won't, as the current consequences is for especially big spending customers being left to feel short-changed by store staff by not being in receipt of the money off vouchers and tokens that their large spend entitles them to and thus encourages the customers to shop elsewhere next time. At the end of the day poorly paid, poorly trained and poorly motivated staff who are ordered around the stores as perpetual wage slaves by senior staff, are only able to exercise any power from within their bottom ranking existence when they deal with customers at checkouts, when they have the power to choose which customers they will select to capitalise on promotions and which customers they will deny in benefiting from promotions. I can imagine many Tesco wage slaves will look forward to such moments when they have the ability to flex some power during what amounts to a largely powerless working day. The bottom line is that whilst Tesco management are busy conjuring up club card vouchers, tokens and sticker promotions to entice customers with, however these schemes are being actively undermined at store checkouts by badly motivated powerless staff who could not care less about Tesco's big picture and this is why Tesco's profits have collapsed and will likely continue their downwards spiral as Tesco stores are increasingly perceived as being places only good for a quick convenience shop rather than a place for the big weekly shops. Tesco management need to go back to square one and realise that what customers want is value for money, not frustrating gimmicks that result in the waving of promotions in the faces of customers that they are frustrated out of capitalising upon. Tesco's demise seems certain as increasingly Tesco's wealthy customers will be found shopping at Waitrose whilst their poorer customers will be found at Lidl and Aldi (UK profits up 124%).